It is easy to make a mistakes when renovating any space let alone bathrooms. It is easy to get carried away with all the options these days and all the advice that comes pouring in from every corner. We can all agree that bathrooms are not just a functional space but a space that is comfortable and aesthetically pleasing as well. Having said that, bathrooms are also not just about pretty fixtures and designs. You have to consider the plumbing, the floor plan and use the right professionals to carry out the work. Our renovation experts have put together a list of mistakes that people should avoid when renovating their bathrooms. A plan is always a good place to start for potential bathroom renovations. Sit with your contractor or renovation company and draw a plan out in terms of budget, type of renovation and timeline. This will give you and your contractor clarity about the project and its expectations, hence avoiding any miscommunication. Planning the layout is also crucial in terms of where the plumbing is located. If you are not replacing the plumbing then it should be a pretty straightforward plan regarding the fixtures. This will also cost less and would not be time consuming. However if you are changing the plumbing around then make sure you get a professional to advice you on the matter. The plumbing will basically determine where all the fixtures would be placed in your bathroom. If you are carrying out bigger renovations such as extension or adding a window etc then hire a contractor who has the license to do so. You would also have to get a building permit for this type of renovation. Waterproofing your bathroom is easily one of the most important aspects of bathroom renovation. If not done correctly, leakages from your bathroom can seep into your walls and floors causing major structural damages. These kind of damages are irreparable and often cost a lot. Most people do not realise that they have leakages till most of the damage is done. There are DIY options for waterproofing however we could not recommend it as it is a tricky job. Again Hire a professional when waterproofing your bathroom. 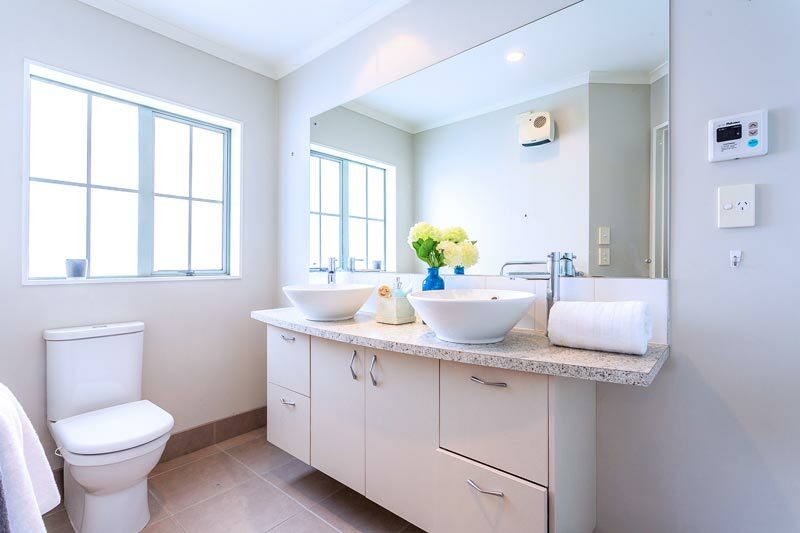 While it is true that renovating a bathroom adds considerable value to a property, it is also true that some people end up over investing in their bathroom renovations. If you are renovating your bathroom for your use then we would say that go ahead and make the bathroom of your dreams. However, if you are renovating it for the purpose of adding value before selling it then make sure that you do not invest too much money as your return on investment would hardly be worth it. In order to add value all you have to do is make sure that you have a good plumbing system, your fixtures and design is not too drab or dated. You do not have to install the most expensive fixtures or go overboard with an out of the world design. Do not over invest in your bathroom renovation if you are thinking of selling the house. This advice cannot come as a surprise. Renovating a bathroom is tricky business. If you are carrying out minor renovations such as changing the vanity or adding a towel rail then it is okay to do it on your own if you have the right experience for it. If you are changing the plumbing, electric wires, adding or replacing fixtures, or doing any structural renovation then enlist the help of a professional. You want to make sure that everything is done correctly and that there are no mishaps in your future. This would only end up costing you more in the long run. Also when you get your renovation done by a licensed professional you will be covered legally and financially. Using inferior quality products is one of the biggest bathroom renovation mistakes that you can make. Good quality products does not always equate to expensive products if you do your research well. They might be more expensive than cheap imported products but they will last you longer hence saving money in the long run. You have to also make sure that your products are compliant with the New Zealand standards.